River King: Mystic Valley (Harvest Fishing in some European regions) takes farming simulation into the fishing simulation genre providing a great alternative especially for fans of fishing. 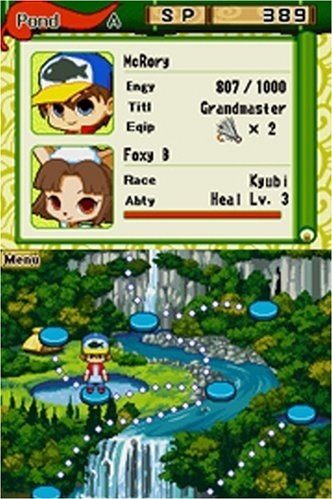 The game is available on the Nintendo DS platform and was released in April 2008. In River King players discover that their sister is unable to wake up due to a mysterious power that has been slowly growing in the forest close to your home. Despite all your efforts she is still unable to wake, your only hope is the power of the River King (an equally mysterious and giant fish). As you adventure to catch the ultimate fish you’ll befriend spirit pets that each have their own special power, catch a variety of fish, interact with a large number of NPCs, collect cards and even have fishing tournaments with friends. 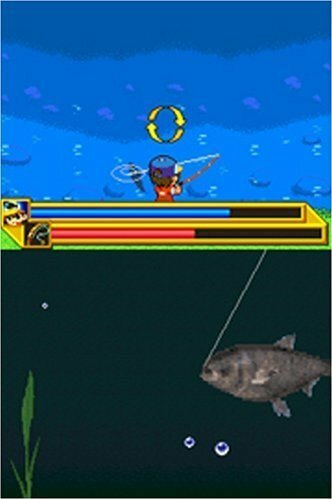 Gameplay doesn’t change much from previous games in the series with the main gameplay still involving the catching fish for points (instead of currency like past games). These points are then spent on bait to catch more fish and eventually upgrading your fishing rod to capture higher quality (and harder to catch) fish. Catching fish also adds to your collectible card collection with most players choosing to try and collect the 100+ possible cards. When you aren’t fishing there is also combat which is done in a Pokemon style fashion with your own pet that slowly grows stronger over time and loves to eat the fish that you catch. Even if you played some of the original River King games this one is still worth picking up despite the similar gameplay. The move to the Nintendo DS platform has opened up a number of control improvements which makes the game much more enjoyable. Go on a long adventure to capture the River King. Upgrade your equipment as you advance. Catch over 100 fish and collect their corresponding card. Support for fishing tournaments with friends.